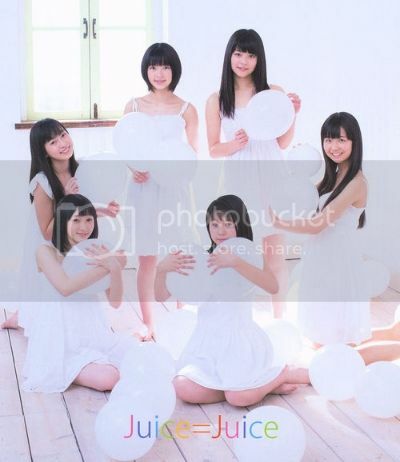 Juice=Juice is a Japanese pop group under Hello! Project, formed with five members of Hello! Pro Kenshuusei and one member of GREEN FIELDS. The group formed on February 3, 2013. In Japan, the proper pronunciation of the group's name is "Juusu Juusu" (ジュースジュース). This group is very promising. Their first single is sooo addictive. Like I've literally had it on constant repeat for the past couple of days. And the members are all so cute! My faves are Kanatomo, Karin, and Yuka. I've really taken to Juice=Juice. I bought their first single as it was too good not to! There second single is a little on the "meh" side for me. I really loved the energy from the first single and I just don't get the same vibe from their second :C It's still listenable but it won't get anywhere near as many listens as "Dakishimenakya". I'm still looking forward to the groups future though and hopefully their next single will recapture their debut's energy. I'm actually a bit worried about their next single...I'm disappointed that it's not going to only be their single, but the Kenshuusei as well. It will be interesting to see how they divide up the lines and screen time. i can't wait for their major single "Romance no Tochuu", the rumours say that it was "elegant mature" song. Apparently Otsuka Aina (whose Juice=Juice fruit/color was orange) has withdrawn from Juice=Juice as well as Hello! Project Kenshuusei. The reason given was it was because the company and her parents could not reach an agreement about her contract. I think she was perhaps the most popular member at the moment, so this is a huge surprise (to me). She was really cute and talented, so sad she has to leave. Or it could have just been a matter of money. Since their daughter was the most popular member, her parents might have wanted more money and the agency wouldn't go along with it. Just speculation on my part though. I doubt it's anything more salacious than that, however. i dont think it was that if anything miyamoto karin is the most popular since all her goods sell out so quickly and shes been around longer. i bet her parents want her to do something other than being an idol. Oh that is really good news [party] ! I personally wasn't expecting a new single announcement so soon. Judging by the names they sound like they'll be really cool! A lot of double a-sides lately it's kind of odd each group has had like two in a row. None the matter it justs means more songs and music videos for us , and with the awesome sound Juice=Juice has I definitely won't complain! yes, of course, i really want it, the 2nd single, and now the 2nd single announced, really looking forward for this single.